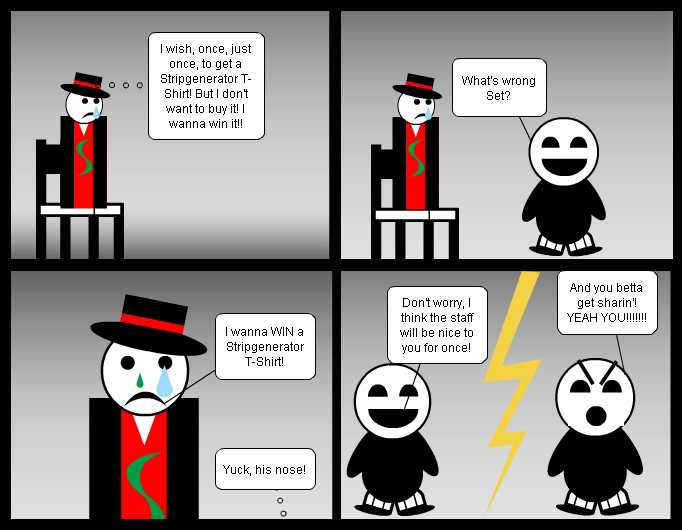 I wish for once I could WIN (not buy) a Stripgenerator T-Shirt. I want to wear it proudly, showing everyone I'm a winner! Please share this with all your friends, like, comment, and vote for featured! I wish, once, just once, to get a Stripgenerator T-Shirt! But I don't want to buy it! I wanna win it!! I wanna WIN a Stripgenerator T-Shirt! Don't worry, I think the staff will be nice to you for once! And you betta get sharin'! YEAH YOU!!!!!!! Yeah, don't think there's often ways to actually win t-shirts. How will the SG staff afford their Ferrari's if you don't buy their modestly priced merchandise? @Nathan2 I know, 'cause you don't get that feeling of a winner... It's like getting a trophee or a gold medal, you feel so proud of yourself..